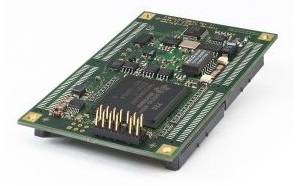 The D.Module2.DM642 is based on the Texas Instruments DaVinci processor TMS320DM642. DaVinci DSPs are optimized for video and image processing. The D.Module2.DM642 is ideally suited for image processing and machine vision in such areas as optical inspection, sorting plants, robotics and biometric access control. Specialized video ports simplify the camera interface and are equally well suited to stream pre-processed image data from an FPGA. The Ethernet port enables remote configuration and maintenance as well as integration into the production infrastructure.